Here’s a better look at my street – market find. When I saw the print and colors on this, I just HAD to have it! When I touched the slinkiest of slinky nylon/poly/whatever fabric, I was over the moon! Just a simple shirt style, with an elongated collar, but the open sleeves are a really fun touch. It will be a very cool Spring statement dress – hard not to get noticed coming down the street in this. And, so much fun to meet the daughter of the woman who had made it. Getting family stories along with the great clothing is the best! Psychedelic hues and patterns on the far left – not hard to see the late Sixties here. The center dress is from the 1950’s and is fashioned in the traditional Hawaiian style, with a panel on the back that is almost like a train, without the dragging hem. instead of being the heavy cotton that I’d usually expect, it is a fluid material that I’d guess is rayon. If the label did not indicate that it was made in Hawaii, I’d say it had come from Japan. The toggle closure at the neck is also something often seen on Chinese and Japanese garments. It’s also got a very 1930’s cut – close to the body. Hmmm . . . . . . . . . this is REALLY Mata Hari undercover espionage stuff. I wonder how she wound her way to the place where I discovered her . . . . . . . . . . . . . . . . . . . . . . . . . . . . . .
LOTS OF 1960’S MOD – THIS ONE FOUND IN PARIS! A standard mod-look vintage plus-size day dress from the early-mid Sixties, but, this one is rare to find today because the fabric is Arnel Triacetate – not many of them around now! It got pushed out of the marketplace by good old polyester, which had some easier-care qualities. However, triacetate feels really good and not exactly like any of the many polyester incarnations that are possible. That’s the beauty of true vintage fabrics – the qualities of most have not/cannot be duplicated by more modern materials. There’s just nothing like them . . . . . . . . . . . . . . . . . . . . . . 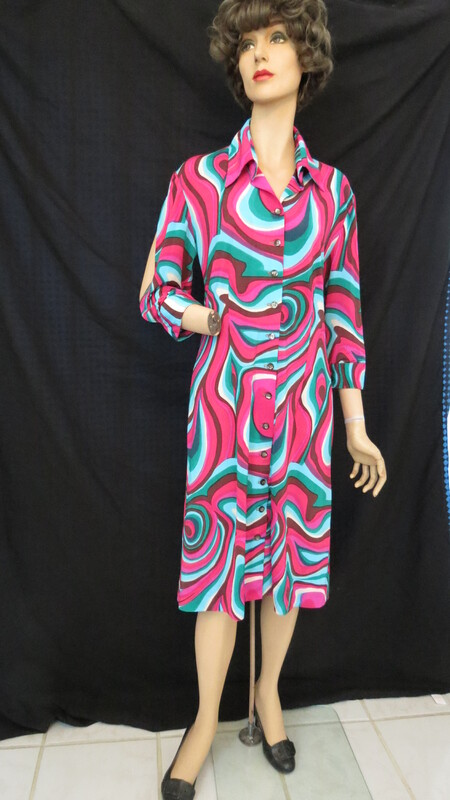 This outfit was custom tailored in the mid-1960’s. Bell sleeves and easy fit. The fabric is a swirly paisley print in aqua tones and it includes the addition of a matching jacket to create an ensemble. So many dresses in the ’50’s and ’60’s were made with matching jackets and even matching accessories. Though this is a fairly casual dress, it follows that lady-like trend and seems to teeter on the edge of the fashion divide between the rather prissy Fifties and early Sixties and the Mod and wild times just after. Looks like the dressmaker originally intended to make a sleeveless frock, then changed her mind. As it is, we’ve got a day dress that Twiggy would look just fab in, photographed on some 1965 magazine cover. What a luxury to have your own dressmaker to custom-tailor your wardrobe! So many women did. Most neighborhoods in the city had a tailor’s shop where this kind of work was done. In towns and villages there was usually a woman nearby who did dressmaking in her own home. And, of course, many women were still doing their own home sewing then. Maybe I’ll take the sleeves off some time and wear this dress with the jacket – but, no . . . . love the dress just as it is. I’ll check out the jacket with my selection of skirts . . . . . . . . . .